The Dark Knight Rises and the end of counterprogramming: Why Batman had no competition at the box office. 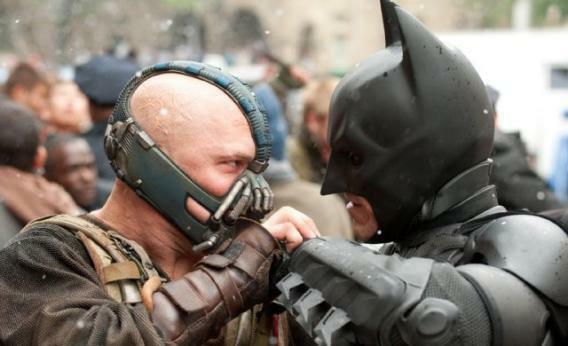 Bane (Tom Hardy) goes head-to-head with Batman (Christian Bale) in The Dark Knight Rises. Photograph by Ron Phillips © Warner Bros. and Legendary Pictures 2012. Moviegoers undeterred by the tragedy in Aurora, Colo. this past weekend had the usual wide assortment of new releases to choose from. They could have caught a matinee of The Dark Knight Rises. Or perhaps an evening screening of The Dark Knight Rises in IMAX. Actually, scratch that. The Dark Knight Rises was the only new movie that came out this weekend, something that hasn’t happened in recent Hollywood history. But Christopher Nolan’s mega-blockbuster is just the latest this year to essentially own its weekend. In May, The Avengers faced The Best Exotic Marigold Hotel (in limited release); earlier in the year, The Hunger Games faced an assortment of limited releases from The Deep Blue Sea, The Raid: Redemption, and October Baby. It hasn’t always been this way. Back in July 2008, Universal released Mamma Mia! against The Dark Knight (No. 4 all-time opening weekend), and the Broadway-inspired musical still made $27.8 million in its debut weekend and $144 million overall domestically, eventually making it the fifth highest grossing film worldwide that year. In 2009, Warner Bros. released The Blind Side against Twilight: New Moon (No. 7 all-time opening), but still made $34.1 million in its opening weekend and $256 million overall. Why has counterprogramming, the industry term for when distributors attempt to give audiences an alternative to a huge blockbuster, largely disappeared in 2012? Because of the ever-growing importance of a movie’s opening weekend box office. Studios can’t afford to suffer a slow start and make it up in later weeks. The risks involved with counterprogramming are thus higher than in previous years. The data seem to back up executives’ fears. According to statistics compiled by the film blog Involuntary Fury, box office revenues are dropping off at a steeper and steeper rate once a movie hits the big screen. In the 1980s, the average film only lost 15.7 percent of its opening week revenue in the second week of release. In the ‘90s, that jumped to 21.5 percent. According to data provided by the-numbers.com, in 2012, the average film now loses 49.1 percent of its box office in week two. It’s also become harder for would-be counter-programmers to find a demographic to cater to. The makers of tent-pole movies have become savvier about offering a point of entry for a wide-range of viewers. For instance, even this summer’s comic book adaptations have made efforts to court a female viewership, with stronger female roles and marketing directed at women. With so much at stake in the opening weekend, it makes sense that no studios dared to face off against The Dark Knight Rises, which made about $165 million this weekend. The ripple effects of a mega-blockbuster like TDKR can even be felt for weeks both before and after its arrival. Ice Age: Continental Drift was the only film to come out the weekend before last because studios “didn’t want their films to get flattened on the second weekend by Batman,” according to Pandya. Universal, meanwhile, recently announced that it is shifting The Bourne Legacy back a week, to August 10, publicly acknowledging the move is due to the fact that TDKR would likely still be dominating theaters in early August. Will we ever see a time like 1989, when Disney boldly marched out Honey I Shrunk the Kids to go up against the biggest opening of the decade, Tim Burton’s Batman? Or how about the weekend of May 25, 1985, which saw one of the biggest films of the 1980s, Rambo: First Blood Part II square off against the wide releases of the James Bond flick A View to Kill as well as Brewster’s Millions? The way things are going, probably not.